Avoid a "Valentine's Massacre" and celebrate Valentine's at Capone's Dinner & Show. Our action-packed speakeasy & cabaret has just enough comedy and romance to satisfy any romantic interest. Fall in love with our talented performers as you dine at a delicious Italian/American buffet. Unlimited drinks are included too! Sweethearts of all ages love our show - you're gonna have a blast! 2 shows - 5:00 p.m. & 8:30 p.m. Discounted tickets (without VIP package) are available for $34.99 adults and $22.99 kids (plus tax). Limited number of VIP Tickets are available each night for $46.99 adults and $31.99 kids (plus tax and gratuity). Order tickets by selecting February 14th or 15th and the performance time of your choice. Want to turn it into a night to cherish forever? Many marriage proposals have been performed at Capone's Dinner & Show. We can make your proposal unique! Want to announce your wedding anniversary? We can let the entire audience know! Talk to one of our Wise Guys or Clever Dames and make your night at Capone's Dinner & Show a night to cherish forever! or fill out the "Ask Al" form on our Contact Page. 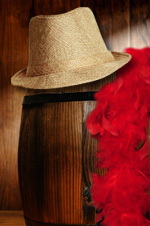 Purchase a red or pink feathered boa or a classy fedora to wear during your visit!